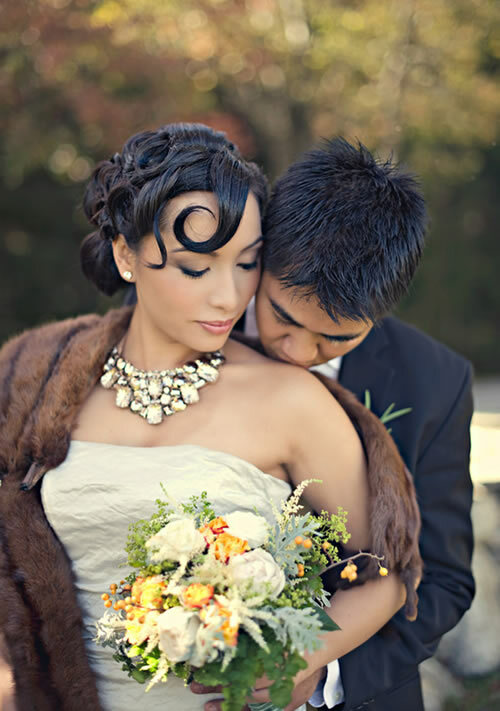 Whether it’s a formal wedding or a more casual wedding, the bride’s hairstyle reflects the bride’s personal style. The updos, which are timeless, are without a doubt some of the most popular hairstyles. 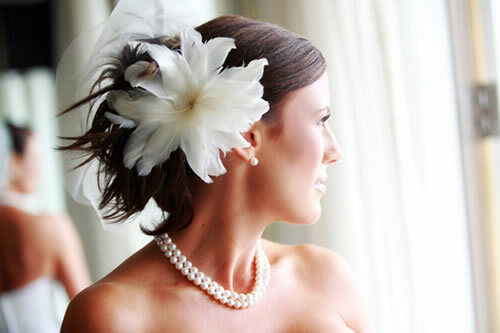 The use of tiaras, flowers, cage veils or simply wearing your hair down are other equally popular options. The most important aspect is that you look as radiant as possible on your wedding day and that, above all, you feel comfortable with your entire look: wedding dress and wedding accessories. You may coordinate your hairstyle with the flowers in the wedding bouquet or base it on the hairstyle your mother wore at her own wedding. We’ve rounded up a selection of elegant and charming hairstyles that will never go out of style and are easily adaptable to any bride’s style. If you go with the greatest of all luxuries you’ll need a bridal hairstyle that matches the look of a luxurious wedding, where the bride is, without a doubt, a total diva. A simple and chic look, where accessories are not necessary, just a well elaborated hairstyle and a wedding dress adorned by the bride, can turn any woman into a very distinct bride. 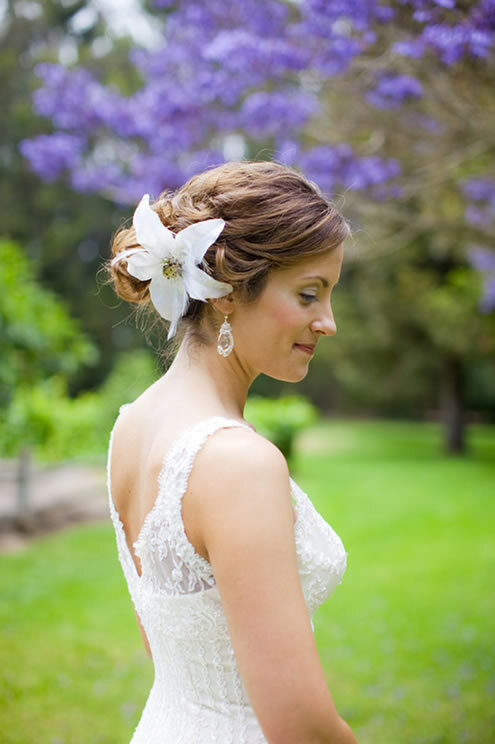 A romantic bridal hairstyle, perfect for a garden wedding. A more formal bridal hairstyle, simultaneously sophisticated and romantic. 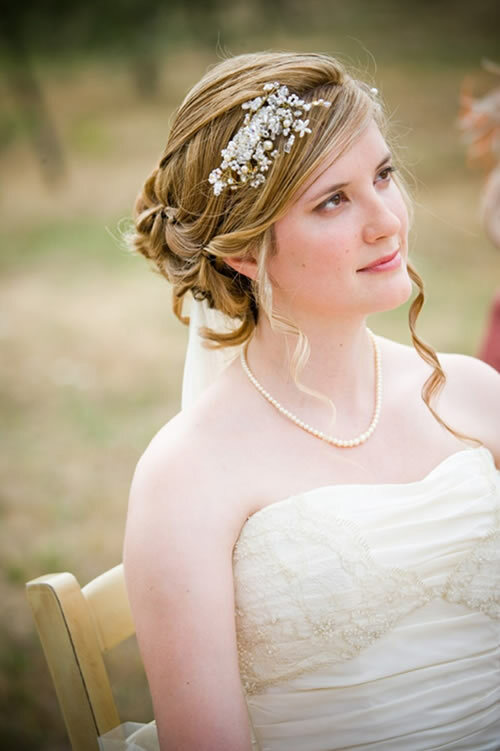 The ideal bridal hairstyle for a formal wedding, complete with a personal and relaxed touch. A detail from a simple bridal hairstyle, where the use of one single flower gave the bride’s look a relaxed and very romantic touch. Perfect for an eco-chic wedding. A detail that invokes the continuation of the wedding dress in the bridal hairstyle could be a very successful idea. Simply chic, an elegant bridal hairstyle that incorporates the use of a flower can definitely accentuate the elegance of the hairstyle. This type of bridal hairstyle has another advantage: it coordinates perfectly with any kind of wedding dress. 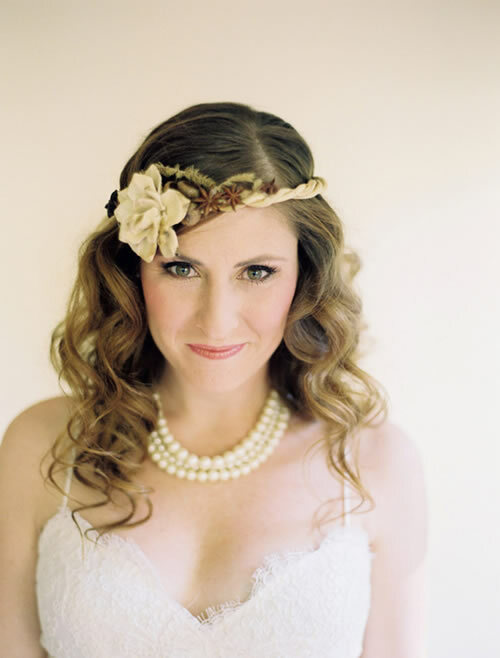 A winter wedding with a matching bridal hairstyle. 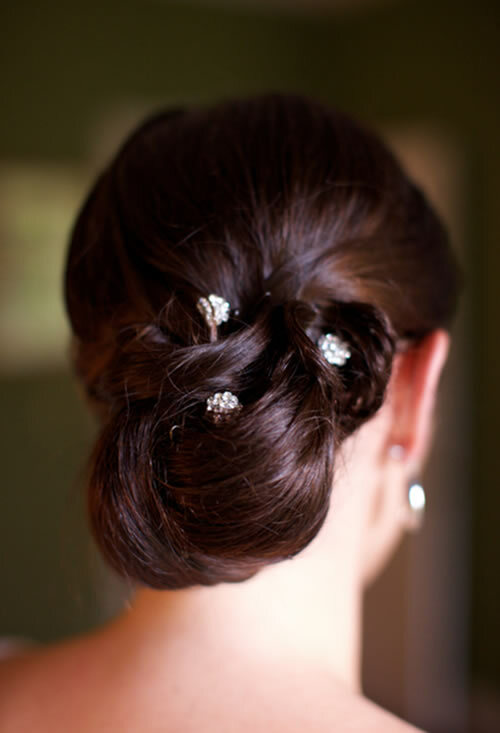 No detail should be overlooked, as is proved by this bridal updo, which is simultaneously relaxed but still formal. A winter wedding requires that the bride’s look matches it perfectly. A very romantic look is achieved with a very casual bridal hairstyle that is ideal for a garden or beach wedding. A bridal hairstyle that is simultaneously modern and vintage can transform any bride’s look into something completely original. 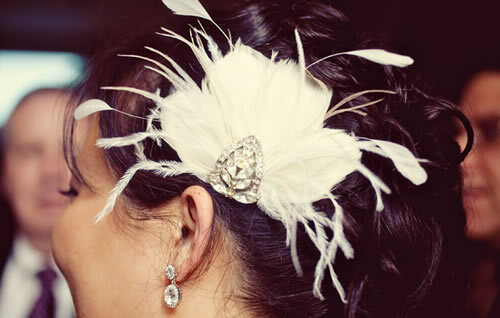 A bridal hairstyle accessory can become truly glamorous when adorned, in the right way and with the perfect dose of jewellery and feathers. A simple updo adorned with a couple of pins is transformed into an effortless and elegant bridal hairstyle. A bridal hairstyle with various accessories, including a feathered flower and a mini-veil may appear to be very bold, but it complements, to perfection, the image of an elegant bride. Anything is possible as long as it is impeccably done. 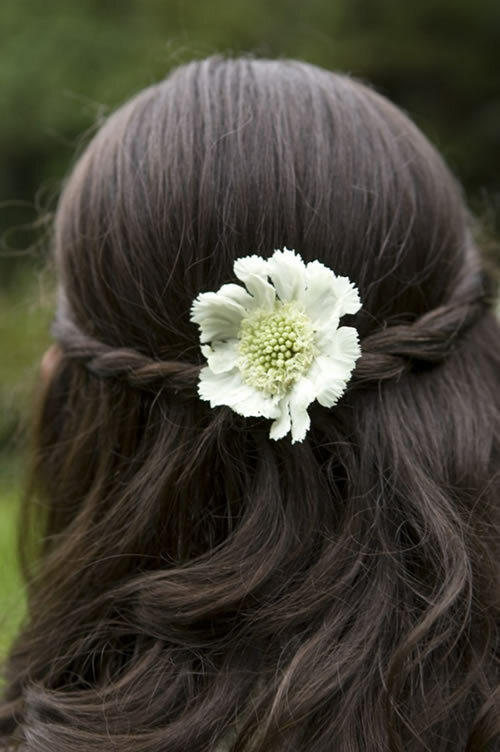 An original bridal hairstyle with a very original accessory: naturally flowing hair and a hippie detail make for a bridal hairstyle with lots of character. A very chic wedding requires a very chic bridal hairstyle and an accessory such as the cage veil is perfect for a chic bride at a romantic wedding. Another suggestion is a 1950s inspired bridal hairstyle where the cage veil and all hairstyles were impeccable and flawless, creating the image of a sophisticated and elegant woman. If this is the bridal style you’re going for, this is definitely the look you should use at your wedding. Another option for incorporating a cage veil in a bridal hairstyle is to pin it with a jeweled accessory. A bridal hairstyle based on a ballet updo, in the style of Audrey Hepburn, with the detail of a simple cage veil, makes the bride shine. The simplicity of the hairstyle and accessories is simply timeless. This hairstyle is perfect for a sophisticated and very elegant bride. A variation on the cage veil – its placement as well as the accompanying bridal hairstyle – can be an excellent idea for a bride who wants to add an original touch to her look. A modern bride can adapt her hairstyle to the idea of a luxurious wedding, where her accessories coordinate perfectly, without outshining one another. A hairstyle that exudes luxury may simply complement the bride’s entire look: wedding dress, shoes and accessories.